My birthday, 19th June 2018 presented itself to be ordinary. While my peers tried convincing me to take an off, we received news of a camera trap being washed away due to a sudden flash flood. In order to confirm the news and relocate our camera trap, I embarked on a trek with our intern, Jyoti, and Saddam, a local community member. We started our trek towards the first camera trap location. The humid weather, murky streams and vivid greenery all posed as obstacles. 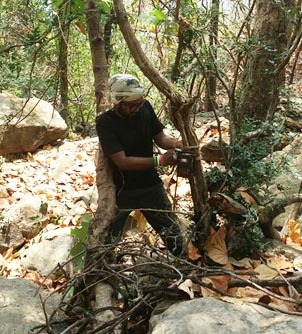 Around 1 pm, we reached our first camera trap point, only to find the cameras still intact. Few metres away, we spotted big pugmarks. Excited about possible snapshots of an elusive feline, we went through the photographs, confirming the presence of a male tiger. Moving towards the next location with enthusiasm, we couldn’t help but notice more pugmarks A number of cheetals and sambars , even the remains of a sambar killed by a large cat; all pointed towards a suitable tiger habitat. Passing through the jungle, with streams gushing down the slopes, we eventually reached our camera trap grid, on the boundary of Lansdowne Forest Division and Kalagarh Tiger Reserve. The animal trail was no longer visible, thanks to the dense bushes and high water level. Blindly relying on GPS and Saddam’s knowledge of the forest, we managed to reach the end of the trail. I still remember the pin drop silence, where the forest was untouched and wild; little grassy clearing, fringed by low hills, lush Sal and Jamun trees along the edges, truly a tiger’s paradise! Saddam suddenly pointed out fresh tiger pugmarks on the sandbank on the opposite side of the puddle. Chances were the tiger must have gotten disturbed during its afternoon siesta by our movement. Years of experience of walking in tiger reserves included numerous instances of fresh pugmarks finds but never the thrill of sighting the magnificent beast. As we took respite, the GPS showed our camera trap location at a mere 100 meters. With a rather strenuous journey, we were not bothered about tigers based on our past experiences. In fact, we were more wary of elephants. The path towards the last location opened to a small ground and I stepped on a dead log to check the way ahead. I was able to find a small animal trail on the hillock. As I moved left, a sudden low-pitched growl took me by surprise. I looked ahead and there it was, at approximately 20 feet, a dark orange figure with black stripes. Initially mistaking it for a cheetal, it took me a few seconds to realize that it was a huge tiger! Frozen with fear, my body had given up while my mind insisted that I should do something but somehow I was unable to. Since the tiger was looking in the opposite direction, I foolishly thought of clicking a picture from my camera. By this time, Jyoti also spotted the tiger. She was just behind me, as motionless as I was. As I tried reaching for my camera, a second tiger crouched and snarled, looking right back at me from the bushes. The eye contact was enough to send chills throughout my body. Before I could react, Saddam reached the spot from where we were able to see the tigers and shouted, “Sir Bagh! Bagh! Sher! Sher! (Tiger…tiger...) Peeche aao peeche aaoo (come back….come back)”. Without thinking twice,,I turned back , shouting at Jyoti to go behind the hillock. Saddam and I started shouting while retrieving back. I noticed that Saddam had fallen in the puddle while trying to get away. We could hear heavy footsteps with the tiger growling. As soon as we looked up, about 10 feet away, on the hill slope just above us we saw a snarling tigress with her sharp fangs and claws unsheathed, poised to pounce! I closed my eyes, involuntarily throwing my hand in the air with my sickle as self-defense. I felt a sharp pain in my knee, as if the cat caught hold of me but I had sliced the skin from my knee when the sickle knocked against it. . I opened my eyes and saw the tiger moving away from me. While recovering, my legs were shaking and my mouth was dry but the adrenaline was high. I turned towards the puddle and noticed that Saddam has gotten out but unfortunately Jyoti had fallen in it and had injured herself. I could still hear the tigers growling. Saddam and I grabbed Jyoti and rushed towards the main road while shouting loudly to scare away the animals. The 4 hour journey to the camera trap took us less than 1.5 hours on the way back. We were exhausted, wet and bloodied with torn clothes. Once we felt it was safe, we stopped and collapsed on the ground. Still in shock, we drank some water in silence. The fear finally sunk in, making us realize how dangerous the encounter was and how lucky we were to have managed to escape. Looking back, it’s unbelievable that we saw three tigers that day. Probably a mother with sub adult cubs, she might have charged at us to protect her young ones. It was an unforgettable experience, which surely changed my perspective on life and how we see tigers. Yes, they are magnificent and glorious but one should appreciate them from a safe distance, as such close could be dangerous. Overall a humbling experience, I still think about the incident, about how helpless I was. Man is so puny in front of nature. I have more respect for the tiger than ever before. It’s a beautiful cat with a strength and fierceness unrivaled.